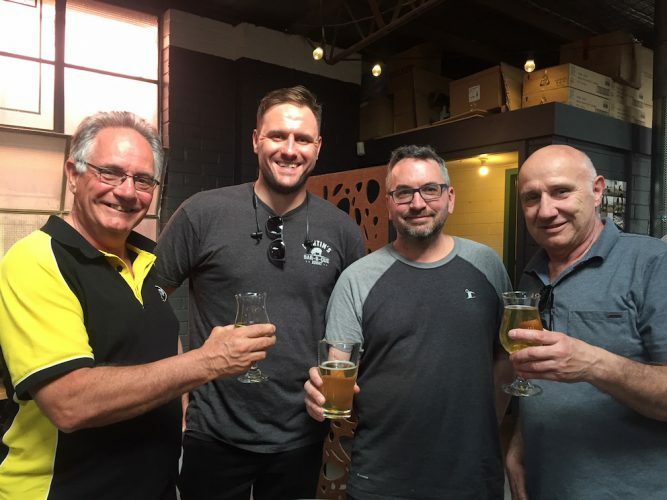 It’s been an exciting time in the world of home brewing here in Melbourne with the Australian Homebrewing Conference (ANHC) taking place at William Angliss. The conference started off with the Australian Amateur Brewing Championships. Entry into AABC was via being placed in VICBREW. 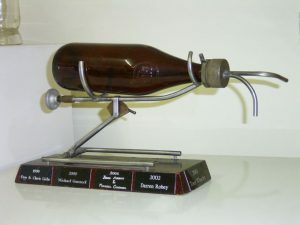 Of the five Melbourne Brewers entered, Hayden Hendersons’ Berliner Weisse was awarded third in the sour beer category. Well done Hayden. 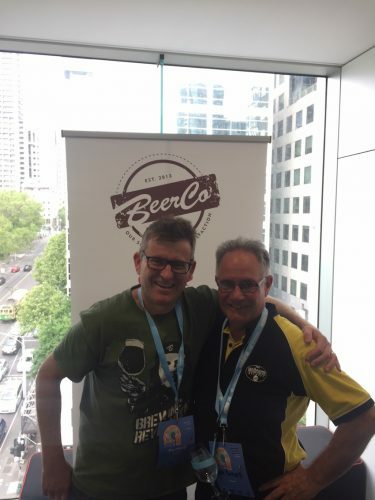 Having spoken to Mike Pooley (First in VIC BREW with his pale ale) he conceded that the competition really rises in the national championships. Unfortunately Mike’s beer went unplaced. 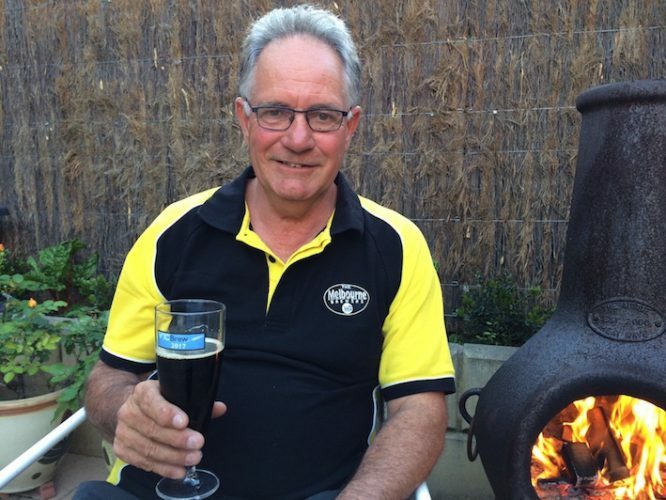 Australian Homebrewing Conference bought to Melbourne a number of world renowned guests to speak on various subjects including experimental brewing duo Drew Beechum and Denny Conn.
At the dinner Braden Jackman’s Munich Dunkel was on the pairing menu. Well done Braden. it was a big month for Braden with his German Pilsner being launched at The Mill Brewery in Collingwood. It was good to see Members of Melbourne Brewing along to Club night where there was more beers to be tasted that possible to drink. If the conference isn’t your thing certainly think about getting along to an ANHC Club Night in future years. The jewel in the month though was John Keske’s effort at Bayside Brewers Octoberfest beer competition where he “cleaned up” ! John won the pale ale and dark ale comps and with his Munich Dunkel won Champion beer and Champion Brewer. Great brewing John and well done. Coming up in the not too distant future is our Christmas Party. To be held at Andy Davidsons’ place on 1st December. It should be a great finish to the year. Reserve the date and get along and bring your family. Planning is well under way for Beerfest in February to be again being held at the warehouse. This event needs our members to be involved. It is the biggest and we want to make it the best beer Club competition in Victoria but to do justice we will need a lot of participation from our members to make it happen. 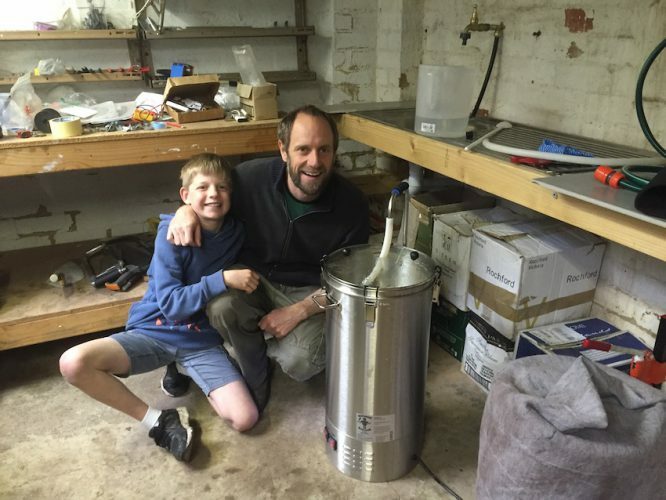 At this month’s meeting Guy Denny and Michael Hewes will be demonstrating how to make a HERMS system. So look forward to seeing you at Pete’s warehouse. The next meeting, 31st of October. Will be held at Petes factory again with a Herms demonstration being held. I grew up in Metung, East Gippsland, my parents still live there so I get down there and out on the water as much as I can. I am pushing mid 40s, have 2 kids and a missus. 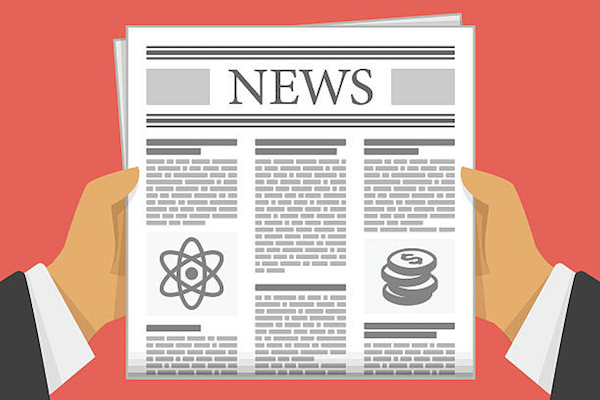 I am an Associate Professor in the chemistry department at Monash University. Being part of the 3 amigos, I followed Guy and Robbo along. It has been great, I love the friendly low key atmosphere and I have learned a lot. The club has a great committee and I think the events they organise awesome. Keep it up! I probably started about 15. My Dad was into brewing from kits so I always had a basic understanding of what it was all about. I made some terrible passionfruit beer to get started, and also a few dodgy stills. Amazing I am not blind. I brewed on and off at uni and also during my PhD years including some terrible cider and blue berry wine. I got back into brewing a year ago and dived into all grain. I tasted some of Guy and Robbos brews and that was it. No more commercial stuff. I have done about 20 batches since I started a year ago, I am addicted!! I keep coming back to IPAs as my standard every second brew. I really like a pacific ale recipe I got off beersmith. Probably IPA, though I had a wicked Saison the other day. love them all! Gotta say, I keep coming back to the Coopers. It doesn’t compete with many of the craft beers pure taste, but I rekon it is the best generic beer and I am bit nostalgic for it, as I drank it all the time with my father in law. I got a robobrew 2, a year ago and it hasn’t missed a beat. I do get called a bit of cheat with this though. Probably my robobrew, I can just put it on and get on with other stuff, I love it. I just kegged a NEIPA, it is a pretty pretty wild and chunky (25% flaked oats), but I reckon pouring that was a highlight. I decided to move a batch of wort I had just made on a trolley. It got the wobbles and the whole lot ended up on the concrete. Normally I swear a lot when bad stuff happens. This time I just made a noise that made my wife think I had hurt myself really badly. Not really a regular at breweries. My son had a soccer final in Mornington a few weeks ago, I was pretty stoked to find that the brewery was a 100 m walk from the ground. I liked the beer there, I would highly recommend it. I am also an old friend of Phils from Last Rites in Tassie, but John already gave them a plug. I do like their coconut beer. I find it really satisfying making something I enjoy drinking and understanding the process and where the flavours come from. I really wasn’t a fan of the stuff I made back in the day, but since I have gone all grain I haven’t looked back. Perhaps I am just more of an alco now…. 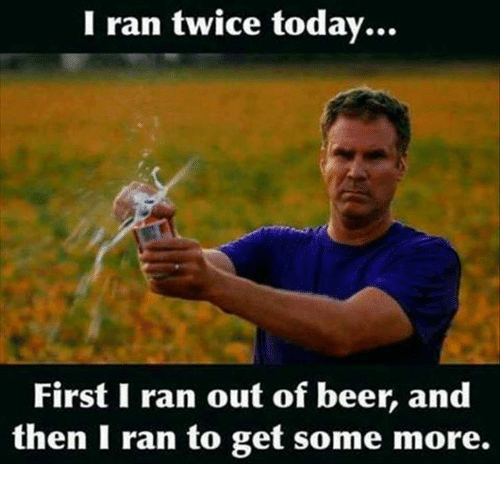 Working off the beer! I try to get out as much as possible, hiking, running, skiing, biking, kayaking, gardening (I want to grow some hops) and camping. Getting some solar panels for my camping fridge…..to keep my beer cold longer. A bloke takes his mates back to his new flat, after a few more beers. “I will show you” and he hits it full pelt with a club hammer! The Committee is seeking interest in the calendar again this year. Initial pricing is putting it in the $120-$130 mark for 24 interesting craft beers. The Christmas party will again be held at Andys house this year on the 1st of December. Lock in the date and get the family enthused! Novembers meeting is the internal lagers competition and the Saison experiment tasting session. Bradens launch at The Mill Brewery. Our members celebrate with Braden at The Mill Brewery at the launch of his German Pilsner. 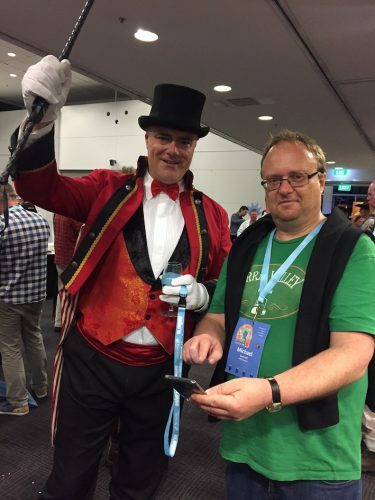 A big welcome to last months newest member, Jarrod Boldt! 28th of November, Internal competition on Pale Lager. Last but far from least, help keep the Club alive and don’t forget to pay your membership fees for this financial year!